Our fourth week giveaway is a $1950, David Yurman pendant with chain. 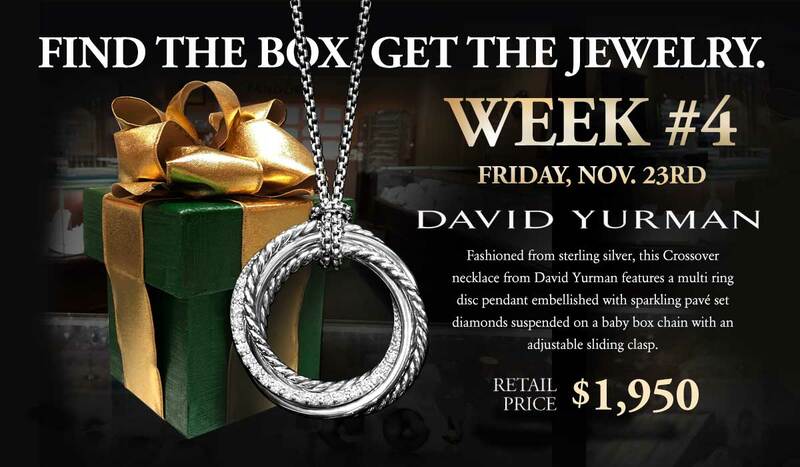 David Yurman is one of the nation’s top jewelry designers and Windsor has thousands of pieces in stock in our store. We have sterling and gold jewelry, for women and for men. This piece is fashioned from sterling silver and it’s from the Crossover Crossover collection. It features a multi ring disc pendant embellished with sparkling pavé set diamonds suspended on a baby box chain with an adjustable sliding clasp. If you come into Windsor and try on a piece of David Yurman, you’ll get to see a clue a day in advance. #1 Clue, Friday Nov. 23rd :: A place of worship where no congregation has met.